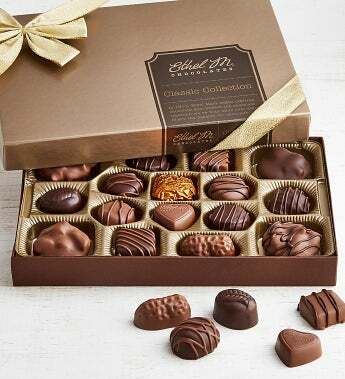 This essential Ethel M Chocolates gift assortment contains their 16 most popular specialty premium chocolates including Lemon Satin Crème, Pecan Caramel Rapture, Almond Butter Krisp, Peanut Butter Milk Chocolate, Coconut Delight, and their original copper kettle Chewy Caramels just to name a few. It's the perfect gift to send for any occasion or take a box to the hostess of your next dinner party. These exquisite chocolates are beautifully displayed in a signature gold Ethel M Chocolates box and tied with a shimmery gold ribbon.